Carbon capture and storage involves capturing carbon dioxide from large industrial sources and storing it deep underground. The International Energy Agency says that carbon capture and storage is one of the most promising technologies available today to significantly reduce global carbon dioxide emissions. Scotford Upgrader in Alberta, Canada. 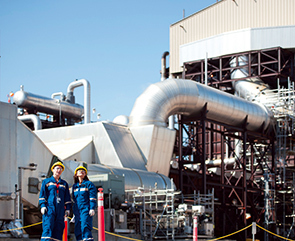 We are developing the Quest carbon capture and storage (CCS) project to capture carbon dioxide (CO2) from our oil sands operations in Alberta, Canada. Quest will potentially capture more than 1 million tonnes of CO2 a year and store it 2 km below the surface, safely and permanently, when it starts operations from around 2015. This is equivalent to removing around 175,000 cars from the road. The provincial government of Alberta and the federal government of Canada are supporting its development with funding of C$865 million as part of their CO2 reduction plans. Pioneering CCS projects like Quest are needed to show how existing technologies can work together effectively. Our Quest project will demonstrate and develop the combined technologies. Many have long been used by the energy industry. For example, the technology to pipe and inject liquefied CO2 underground has been used to increase the flow of liquids from oil fields in North America for more than three decades. If CCS is to have a significant impact on global CO2 emissions it needs to be supported by governments and taken up widely by industry, including power generation companies that produce electricity from coal, gas and oil. Quest is being constructed on behalf of the Athabasca Oil Sands Project (Shell interest 60%). It will capture up to 35% of the current CO2 emissions from the Scotford Upgrader, a facility around 40 km from the city of Edmonton, Alberta. The Scotford Upgrader is where bitumen, a heavy oil, is turned into synthetic crude oil using hydrogen. The captured CO2 will be compressed to a liquid state. It will be transported 60 km through an underground pipeline to three wells north of the Upgrader in Thorhild County. The CO2 will then be injected into an underground porous rock formation, below multiple layers of impermeable rock. To protect shallow ground water during injection, the wells will have three barriers of steel casing, each cemented in place. There is a rigorous monitoring programme in place to confirm that the CO2 remains safely and securely underground. This will involve drilling and monitoring additional wells near the injection wells and testing existing ground-water wells to establish a baseline allowing us to verify that there are no impacts from the project. Before the project began we were aware that public acceptance and local community support would be critical to the success of the project. We have engaged extensively with communities, including holding meetings with local residents to offer information about the project and to address any concerns. Consultation with landowners has led to a number of changes to the originally intended route of the pipeline. We are also avoiding farmland during harvest season while constructing the pipeline. We have established a community advisory panel, with 10 members from the community, as a way of sharing information about the monitoring programme. The panel will review the results of the monitoring programme and serve as advisers to Quest’s monitoring team. The panel members include local land owners, a county councillor, an emergency services worker, a university professor, a school principal and a government medical representative. Shell is also involved in other CCS projects. In Australia we are a partner in the Gorgon offshore natural gas project (Shell interest 25%). This will take naturally occurring CO2 produced with natural gas – which would otherwise be released into the atmosphere – and store it over 2 km underground. We are also a partner in the CO2 Technology Centre in Mongstad, Norway, which is developing and testing CCS technology. We have also submitted a proposal to the UK government for a project to store CO2 in a depleted gas reservoir in the North Sea. During 2013, this project, which will potentially capture and store around 10 million tonnes of CO2 from a gas-fired power station in Peterhead, Aberdeenshire, was chosen by the UK government as one of two preferred candidates to progress to the next phase of engineering design. In early 2014, Shell signed an agreement with the UK government to progress detailed design of the Peterhead CCS project.